Begin incorporating brass into your metal jewelry designs with this ultimate collection combining materials and expert instruction. While brass used to get a bad rap, this superb alloy is affordable, versatile, easy to use, and back in vogue. 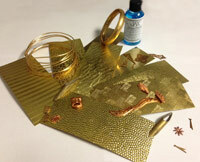 Begin incorporating this stylish metal into your jewelry desings with this exclusive material kit! Basketball skin brass sheet, 2.5" x 6"
Waves brass sheet, 2.5" x 6"
Hammer peen brass sheet, 2.5" x 6"
Random textile brass sheet, 2.5" x 6"
Taffeta brass sheet, 2.5" x 6"
Pebbles brass sheet, 2.5" x 6"
Discover every tool, technique, and tip you need to get started making metal jewelry, or perfect your expisting skills. Containing 168 pages of basic (and not-so-basic_ metalworking tool overviews, this authorativie book is structured like a complete coruse in metalsmithing and is one of the most comprehesive metal jewelry-making books. Make bracelets, earrings, and pendants with this project collction eBook. Packed with 10 beautiful project, advance your jewelry-making skills in forging, wire working, metal clay, stamping, soldering and more! Bonus: This collection includes 6 beautiful projects!